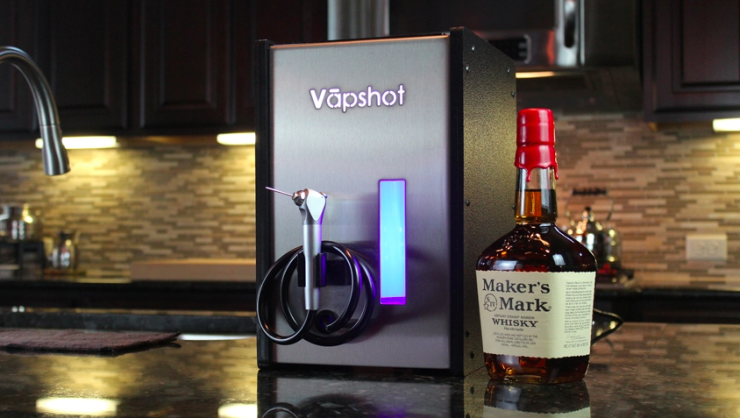 Vapshot Mini Vaporizes Your Favorite Liquor For An Instant Buzz | OhGizmo! The Vapshot Mini is a home-use machine that takes your favourite liquor and vaporizes it so you can consume it through your lungs, rather than through your stomach. This means you feel the effects much more quickly, and actually use much less alcohol to achieve the same blood alcohol concentration. In fact, you’re using about 1/60th of the normal volume of alcohol, which also means you’ll sober up much more quickly; insufflation (the act of blowing vapour into a body cavity, like your lungs) is a much more efficient method of consumption, which explains these particular dynamics (quick to get drunk, quick to sober up, little alcohol use). It’s an entirely different experience than drinking, and doesn’t appear to be as unsafe as some people might have made it out to be. You can use your own spirits, and you will still taste them as you inhale them. It’s $899 for the machine, which comes with two “serving bottles”, which are necessary to consume the vapour.